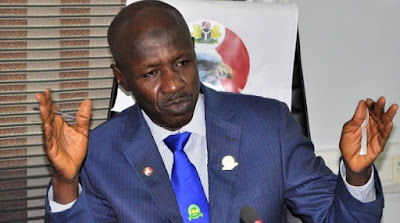 The acting Chairman of the Economic and Financial Crimes Commission, Ibrahim Magu, has told the Inter- Governmental Action against Money Laundering in West Africa that Nigerian politicians are hell-bent on destroying the achievements of the EFCC. He said one of the ways they planned to achieve this was through the creation of a new Nigerian Financial Intelligence Unit which had party been accomplished through a bill that had been passed by the Senate. Magu said this in Abuja on Wednesday when a delegation of GIABA officials paid a courtesy visit to the headquarters of the EFCC. GIABA is the institution of ECOWAS responsible for facilitating the adoption and implementation of Anti-Money and Counter-Financing of Terrorism in West Africa. He said the suspension of the NFIU from the Egmont Group was based on ‘misinformation’ by those who are hell- bent on handicapping the EFCC, describing it as a case of ‘corruption fighting back’. According to him, the frantic move by the legislature to take the NFIU out of the EFCC was suspicious, and borne out of an ulterior motive. Magu added, “There is a complete misunderstanding about the workings of the NFIU, and it is surprising that the new bill by the legislators pushing for removal of the NFIU from the EFCC was passed in seven days,” he said, adding that it was “a practice that has never happened in any part of the world”. He, however, stressed that the EFCC was not at loggerheads with the NFIU. The EFCC boss said, “I have confidence in the management of the NFIU and the Special Control Unit against Money Laundering and the relationship is very cordial and professional,” he said, stressing that the EFCC was “very much in support of the NFIU’s autonomy”. He further noted that the African continent should consider the establishment of an association of African Financial Intelligence Units.